RIT alumna Ashley Aberg has traveled internationally to present her groundbreaking research. Her experience prompted her family to create an award that will be given to science, technology and society students in the College of Liberal Arts. 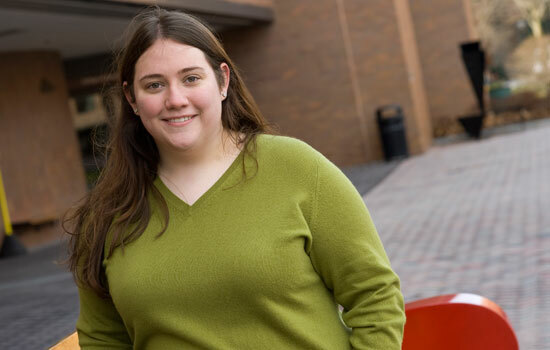 RIT alumna Ashley Aberg, a 2012 graduate from the College of Liberal Arts, is hoping an award created by her family will provide substantial financial assistance to RIT students looking to promote their research. The Aberg Family Travel Award—an annual award worth up to $5,000—will help cover expenses incurred in conjunction with attending a conference or academic event in order to promote better understanding of the work of a student minoring in science, technology and society. The award—set up by Aberg and her parents, Peter and Randy—is to be split between the student and his/her faculty mentor. One of the highlights of Aberg’s tenure studying at RIT was working alongside professor and mentor Deborah Blizzard on research associated with the ethical dilemmas faced by parents of intersex infants, the population of about 2 percent of newborns who are born with reproductive or sexual anatomies that don’t fit the typical definitions of female or male. This successful student-faculty partnership resulted in a trip to Madrid in 2011, where Aberg presented her research in front of accomplished scientists and physicians at the International Association for the Study of Sexuality, Culture and Society conference. Aberg graduated from RIT in 2012 with a bachelor’s degree in philosophy and minors in psychology and science, technology and society. The inaugural award will be presented during spring quarter.